Bernardus Joannes Koldewey, often also spelled Koldeweij, was born on May the 29th of 1895 in Dordrecht. Although destined to become a textile merchant, he decided to become an architect. In 1920 he began taking lectures at the Delft Institute of Technology and worked at the office of A.J. Kropholler, together with his friend C.M. van Moorsel. He set up an architect's practise in Voorburg in 1925, just like Van Moorsel had done before him. Although Koldewey and Van Moorsel had seperate offices, both in Voorburg, there are many paralels between them. Occasionaly they worked together. 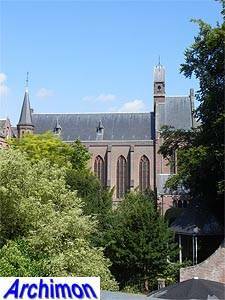 They shared the same ideas about the purpose of catholic church architecture as expressed by architecture professor M.J. Granpré Molière, the leader of the Delft School and were both greatly influenced by the work of their former employer Kropholler. 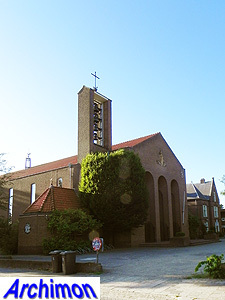 Koldewey was a regular contributor to the R.K. Bouwblad, the architectural magazine Van Moorsel founded for the catholic artists association AKKV. In articles and lectures Koldewey manifested himself as an advocate for an architecture that rooted in national traditions and as a strong opponent of both modernism and Expressionism. In 1936 he was elected a member of the Dutch committee for the Paris World Exhibition of 1937, but he soon resigned out of disagreement with the design for the Netherlands pavillion, which according to him had no Dutch national character. 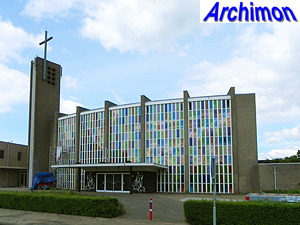 Like some other catholic architects, in 1941 he was involved with the fascist and collaborative movement Nationaal Front, for which he held at least one lecture and wrote a few articles about architecture. Many if not most, of the assignments Koldewey got came from catholic parishes, religious orders or other catholic organizations, such as housing corporations. These include schools, monasteries, convents, hospitals and houses. 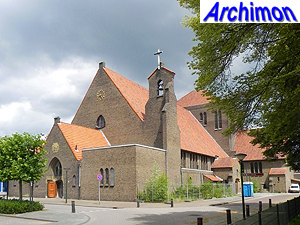 The first assignment for a true church appears to be for the St. Jozef in Geldrop, built in 1932, which he shared with Van Moorsel. Koldewey's religious work until ca. 1940 shows large similarities in style with the work of Kropholler and Van Moorsel. In the 1950's his ideas and style changed radically, and in 1954 he associated himself with his son H.J. Koldewey, who had been working as a draughtsman at the office. This late period saw experiments with concrete constructions, as well as an increasing influence of Functionalism. 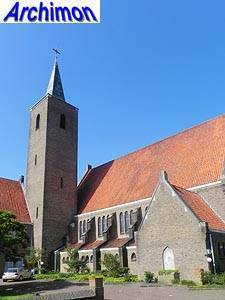 Koldewey died in Voorburg on January the 8th 1958; his son continued the office and designed several more churches, all in modern styles, until the early 1970's. The following is a list of B.J. Koldewey's churches and related works only, including those he designed in conjunction with his son. It's probably incomplete. Building in Traditionalist style, with chapel. Demolished in the 1990's. Chapel in Traditionalist style with a wide and low nave with a higher choir and an open tower at the front. Part of a complex, designed in conjunction with C.M. van Moorsel. Complex in Traditionalist style with a convent, three schools and a chapel. Formally designed in conjunction with W.C.A. Kroes, but his role is unclear. Koldewey replaced the choir of the Neo-Gothic chapel by a bigger and higher one. Aisleless church in Traditionalist style. Only half completed; instead of the planned tower a bell-gable was added. Demolished in 1968. Enlargement of a Neo-Gothic church from 1887, designed by A. Tepe. Koldewey replaced the choir by a new and bigger one in Traditionalist style. Also replaced the upper part of the tower, which he gave a saddle-back roof. Completion of the abbey started by A.J. Kropholler before the war. 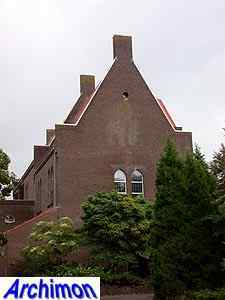 Koldewey designed several parts, including the church. Chapel for a youth center, built in the attic of a house. Enlargement of a Neo-Gothic church; new transept and choir. Church in a modern Traditionalist style, with front with pillars and an open bell-tower. Designed in conjunction with H.J. Koldewey. Koldewey made a first design already in the 1930's. Aisleless church in modern style. Designed in conjunction with H.J. Koldewey. Demolished in 2001. 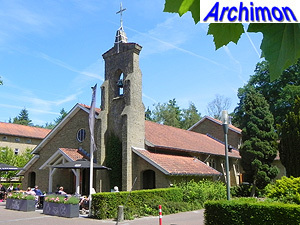 Aisleless church in modern style, with trapezoid ground-plan. Designed in conjunction with H.J. Koldewey.